Deliberation and discussion between people with open minds is the cornerstone of a healthy democratic society. But this ideal seems to be slipping away in the face of increasingly partisan hostility. Open-minded political discussion is vital to a healthy democracy. Dating back more than 2000 years to Aristotle, many democratic theorists have extoled the role authentic, inclusive, and respectful discursive exchange plays in legitimizing political decisions. These theorists argue that this “deliberative” ideal can promote consensus-building and compromise on even the most divisive issues of the day, and it can also encourage learning and empathy from those that participate. They thus advocate for vibrant deliberative discussion at all levels of society—from legislative chambers to debates with neighbors, and everywhere in between. A key—the key—to the deliberative democratic ideal is mutual respect. Not any political discussion will do; discussion and debate must be marked by open-mindedness, recognition of the legitimacy of moral differences, and a goal of achieving consensus. Mutual respect, however, seems in increasingly short supply in the US public. There are countless examples of vitriolic and demagogic rhetoric, from both politicians and their supporters, from the 2016 election cycle. Moreover, a recent Pew Research Center survey finds that majorities of both Democrats and Republicans prefer a politician that “sticks to their positions” rather than compromises. Another Pew survey finds 44 percent of Democrats, and 45 percent of Republicans, have a “very unfavorable” view of the other party. What drives these anti-deliberative attitudes? And under what conditions can ideals such as mutual respect hold in cross-party political discourse? 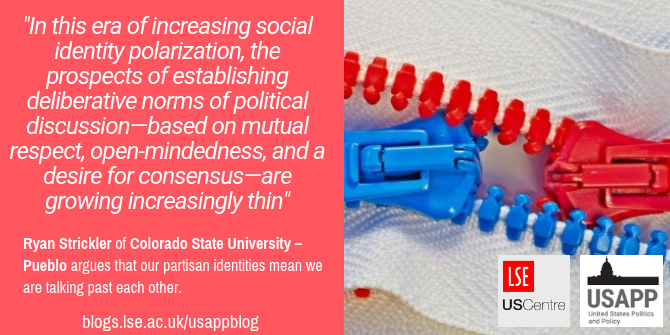 In recent research, I show the powerful role partisan identity plays in driving the public away from mutually respectful discourse. I find that it is not party per se that creates hostile attitudes toward deliberation. Rather, what matters is the importance of one’s party as a relevant social identity, or the extent to which one views being a Democrat or Republican as an important party of “who one is.” Regardless of which side of the aisle one is on, and regardless of one’s opinion on the issues, whether one is willing to listen to countervailing claims, as opposed to engage in party-based motivated reasoning, depends on the role party plays in one’s image of one’s self. The source of the counterargument is randomized, coming from either their own party, the party that they disagree with, or a neutral person. From there, respondents are asked a series of questions gauging whether they are willing to approach the claim with deliberative ideals in mind. Partisans in these experiments exhibit a bias against deliberative ideals when faced with disagreement. Crucially, the strength and consistency of these biases depends on the strength of one’s party as a social identity. Figure 1 below shows the proportion of Republican and Democratic respondents stating that the counterargument they receive is “not at all reasonable,” broken down by argument source. 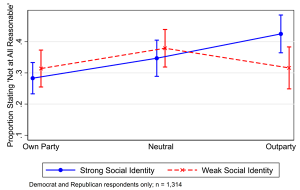 Respondents are further subdivided based on a series of questions assessing whether they have stronger, versus weaker, social identity attachment to their party. 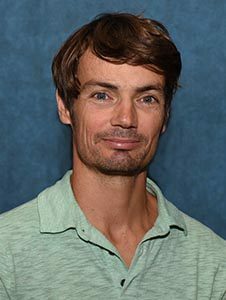 We can see that partisans with strong social identity attachments display a consistent bias; they are both more likely to see a counterargument as reasonable if it comes from their own party as opposed to a neutral source, and less likely to see it as reasonable if it comes from the political party they do not support. 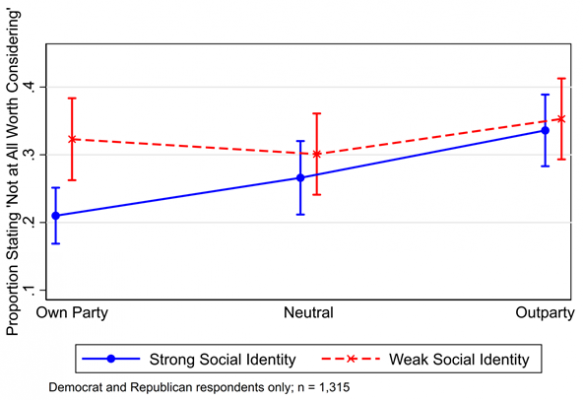 Partisans with weaker social identity attachments, however, are not as likely to dismiss arguments from the other side of the political aisle as unreasonable. 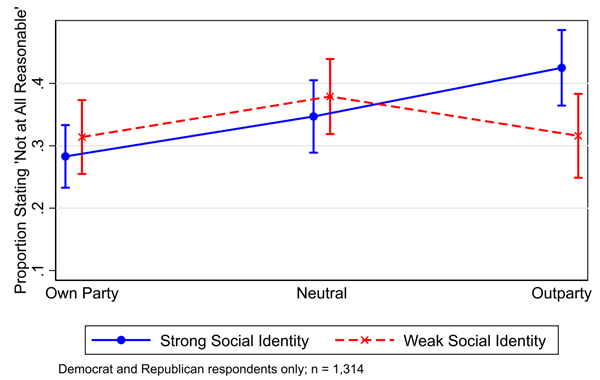 Similarly, partisans with strong social identity attachments are less likely to consider other points of view with regard to the issue of civil liberties. Figure 2 shows the proportion of partisan respondents stating that the counterargument they receive on this issue is “not at all worth considering.” Again, these results are broken down by the source of the argument and the strength of respondents’ social identity attachment. As with the issue of immigration, those with strong partisan social identities are both less likely to state that an argument from one’s own party is not at all worth considering as opposed to a neutral source, and morelikely to state that an argument that comes from the party that they do not belong to is not at all worth considering. 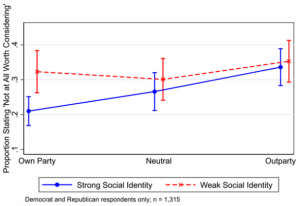 Those with weaker social identities, however, do not consistently display biases based on party cues. These results hold up regardless of the specific counterargument respondents receive, and regardless of whether one is a Democrat or Republican. Moreover, this pattern of deliberative bias is not present for partisans with strong issue-based attachments to their party’s platform. It is social identity attachment, and not the issues, that motivates partisan biases in deliberative reasoning. 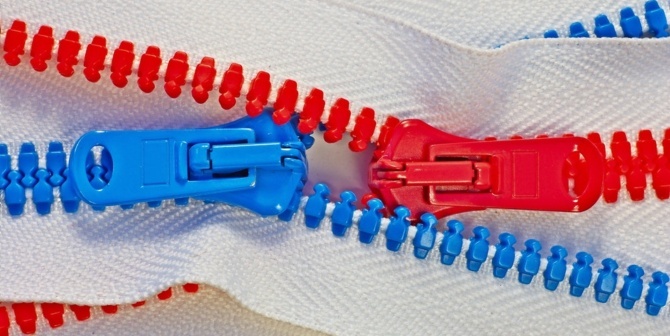 My findings point to a pernicious effect of modern polarization. Traditionally, political scientists have studied partisan polarization as an issue-based construct. Are Democrats and Republicans moving farther apart in opinion with regard to the issues of the day, or their underlying ideology? An emerging body of research, however, has demonstrated that “polarization” in the public is based less on the issues, and more on the growing strength of partisan social identities and the “us vs. them” mentalities they create. They may or may not disagree on the substance of political debate, but partisans increasingly choose to live in different communities, watch different news and entertainment media, and even consume different alcoholic beverages. They are increasingly hostile towards “interparty” marriage, and they are even willing to discriminate in hiring based on party. My research shows that, in this era of increasing social identity polarization, the prospects of establishing deliberative norms of political discussion—based on mutual respect, open-mindedness, and a desire for consensus—are growing increasingly thin. This is not all bad, as the importance of partisan social identity has been shown to produce greater enthusiasm for political participation. But if authentic, inclusive, and respectful discourse—not only in the halls of Congress, but in “everyday” sites of public discussion—is a hallmark of a healthy democracy, the psychological aspects of modern polarization are something to worry about. 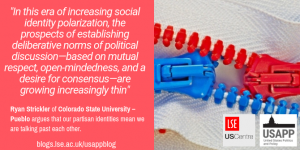 It thus is up to researchers and practitioners to figure out how stronger deliberative norms can be fostered in the era of strong partisan social identities.